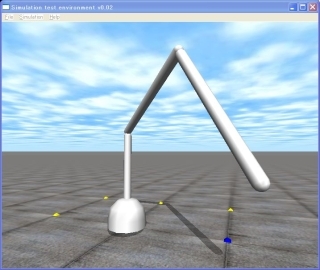 This is the 13th ODE (Open Dynamics Engine) tutorial. This time, let’s make a simple 3-articulated (DOF: Degree of Freedom) robot arm gathering knowledge so far. Using the ODE, you can make such a simulator only about 100 lines. Collision detentions are omitted to simplify the sample program. The robot can be operated by a keyboard. The first joint can be moved by the ‘ j’ (increase) or ‘f’ (decrease) key, ‘d’ and ‘k’ keys move the second joint, and ‘l’ and ‘s’ keys moves the third joints. To move the joints, using a simple control, the P control, which controls the joint proportional to the difference between the current value of the angular velocity and the target velocity. The current value of joint angle values and the target are far apart, if you have a large angular velocity and angular velocity if the goal is the same as the value 0 to stop the next joint. Also, as the target for the current best value, you will be a negative sign for a reversal of rotation, and the current value is close to the target value. The control function realizes that. dParamVel is the target angular velocity, and dParamFMax is the maximum torque to realize the angular velocity. If dParamFMax is set to 0, you cannot control the joint, because the torque is not provided to the joint. The source code, sample13-110105.zip, can be download from here.